Eric Allen, thirty-three-year-old line cook, moved in with his grandmother, Jewell, after a disastrous coming-out when he was in middle school. She raised him, and he cared for her when she fell ill. When Jewell died, she left everything to Eric—angering his parents and older brother. The inheritance isn’t much, but Eric and his bestie, Nathan, pool their money and buy an abandoned hotel on an isolated stretch of the Central Oregon Coast. The hotel isn’t far from Lincoln City—a town with its own Pride Festival and named for a president—so they christen it Buchanan House after James Buchanan, the “confirmed bachelor” president with the close male friend. Eric and Nathan need a handyman to help them turn Buchanan House into the gay resort of their dreams. Eric finds Tim Tate in the local listings, and over the months leading to opening weekend, Tim reveals himself as a skilled carpenter with many hidden talents. Eric falls hard for Tim, but before he can see a future with the gorgeous handyman, he has to get over twenty years of being bullied and shamed by his birth family. It would be much easier if Eric’s brother Zach wasn’t trying to grab part of the inheritance or ruin opening weekend. Have you ever read something that had just….too much? Maybe it was the writing or the plot. This time it was the characteristics, and they were excessive. I have a tendency to grab the small handheld basket at the grocery store thinking I just need a couple of things. Before I know it, it’s overflowing and I’m lugging a ridiculously heavy load. The eggs risk getting cracked and the bread smashed. That’s how I felt here- the characters were spilling over and it damaged my enjoyment factor. Would you like an example? Okay, as far as couples go here’s the list: Mostly straight. Lesbians. Gay. Trans. Bisexual. Asexual. Triad. A pair of double third cousins. *blinks* I mean, you name it and it’s here. This could be completely personal, but it was bothersome. It felt forced. A point was made during the renovation to make things ‘accessible’ and then lo-and-behold a handicap guest made a reservation opening weekend. These were the small details that came across as unnatural. Then a BIG detail was more than unnatural and it shoved me out of the story. Eric’s beloved grandmother passes away and leaves her entire estate to him. She was the center of his world. The rest of his family are horrible people. They don’t deserve the honor of being considering ‘family’ and have absolutely no shame. Thankfully Eric is blessed with an amazing best friend. I tried not to look too closely at the details of their relationship because I was afraid of what I might find. I enjoyed them as irreplaceable besties and wanted to leave it at that. Nathan is flamboyant and fun. I liked Nathan and loved how he cared for Eric. They decide to take a gamble and purchase a deserted hotel with the high hopes of flipping it into a resort. They envision a gay retreat that will cater to all facets of the rainbow. That certainly did attract a vast assortment of guests, again, perhaps too easily? Tim Tate, the local handyman accepts the challenge of giving the resort a massive face lift. A substantial amount of work needs to be done before their grand opening weekend. They race against the clock to finish in time. Despite the heavy work load, Eric and Tim find time to act on the heated looks and flirty signals. This is where the slightly rocky road became so unsteady that I was thrown out of the story. I think I missed something? There was no relationship building, suddenly it was….there. It was more than rushed, it felt nonexistent. I’ve read Descoteaux’s stories before and really enjoyed them. Be that as it may, this one was a clear miss. 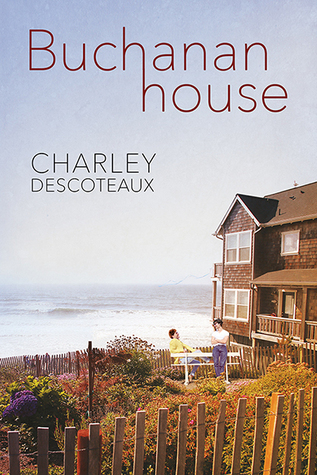 This entry was posted on August 27, 2015 by Sheri in Contemporary, Reviewer: Sheri and tagged 2.5 Stars, charley descoteaux, dreamspinner.